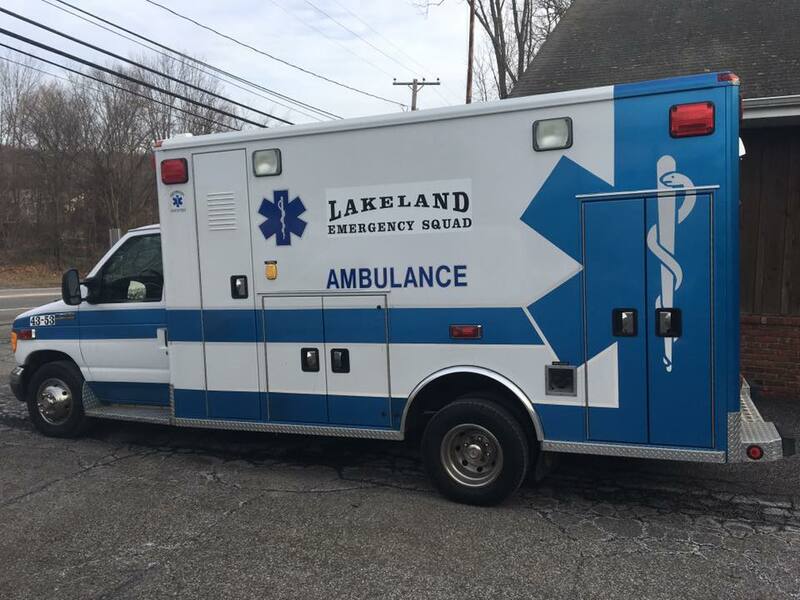 BLS 4351 is a 2016 Horton 523 on a Ford F450 Super Duty 4×4 chassis, and runs out of Lakeland Headquarters in Byram Township where she shares the the first-out rotation with 4352. BLS 4351 is the twin of 4353; both ambulances were remounted in 2017 by VCI Emergency Vehicles. Following the remount process and State DOH inspection, BLS 4351 returned to service on October 12, 2017. BLS 4352 is a 2009 Horton 553 on a Ford E450 Super Duty chassis. 4352 is the twin rig of 4355 and is assigned to Station 1 in Byram where she shares a duty rotation with 4351. 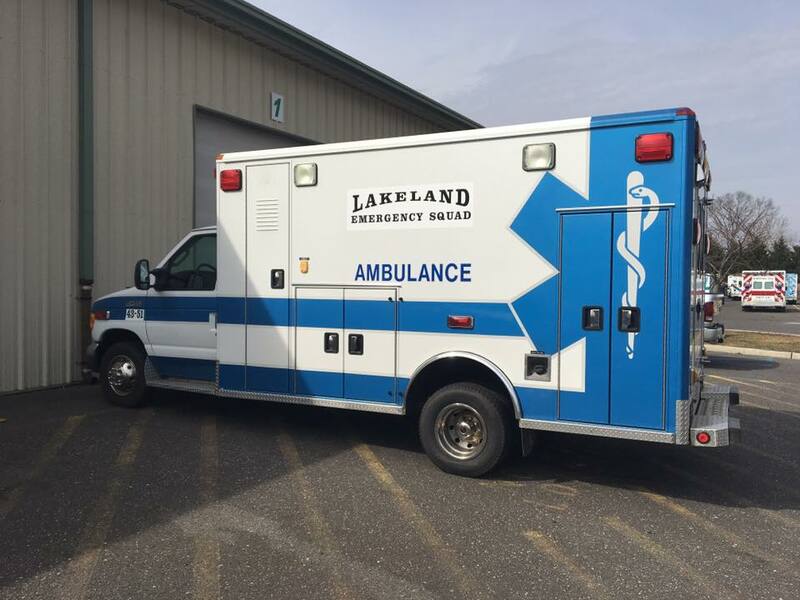 This ambulance became licensed by the State DOH following inspection on February 10, 2017. BLS 4353 is a 2016 Horton 523 on a Ford F450 Super Duty 4×4 chassis. 4353 runs out of LES Station 2 in Andover Township where she shares the the first-out rotation with 4355. BLS 4353 is the twin of 4351; both ambulances were remounted in 2017 by VCI Emergency Vehicles. Following the remount process and State DOH inspection, BLS 4353 returned to service on September 8, 2017. BLS 4355 is a 2009 Horton 553 on a Ford E450 Super Duty chassis. 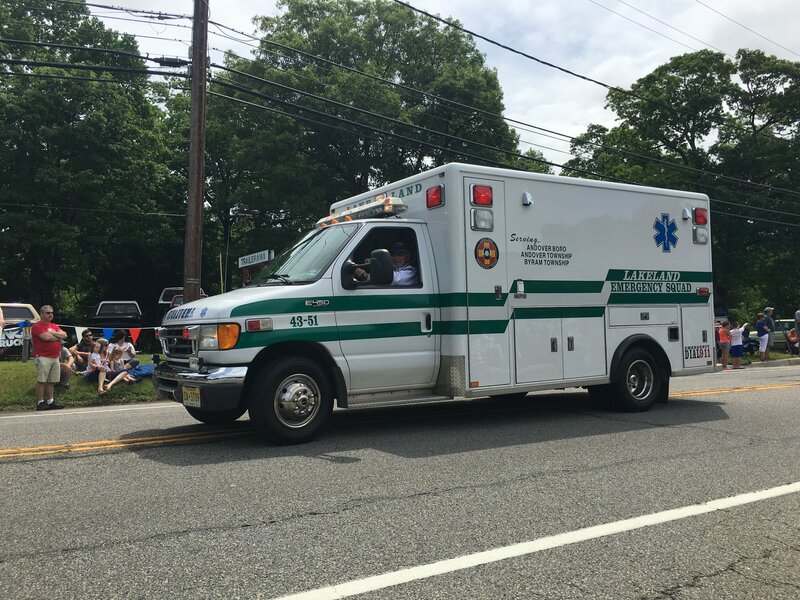 This unit is designated as a Rescue Ambulance and assigned to Station 2 in Andover Township. 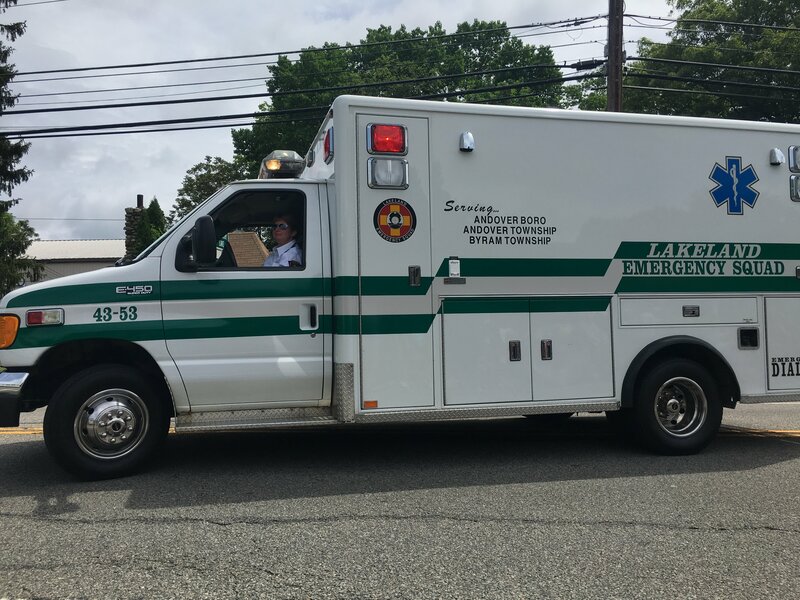 She is the identical spec to 4352, but 4355 is the only ambulance in the fleet which carries Powerhawk extrication (JAWS) tools hence the 5-5 designation and not 5-4. BLS 4351 and 4352 are both setup to carry the Powerhawk tool should 4355 be out of service. 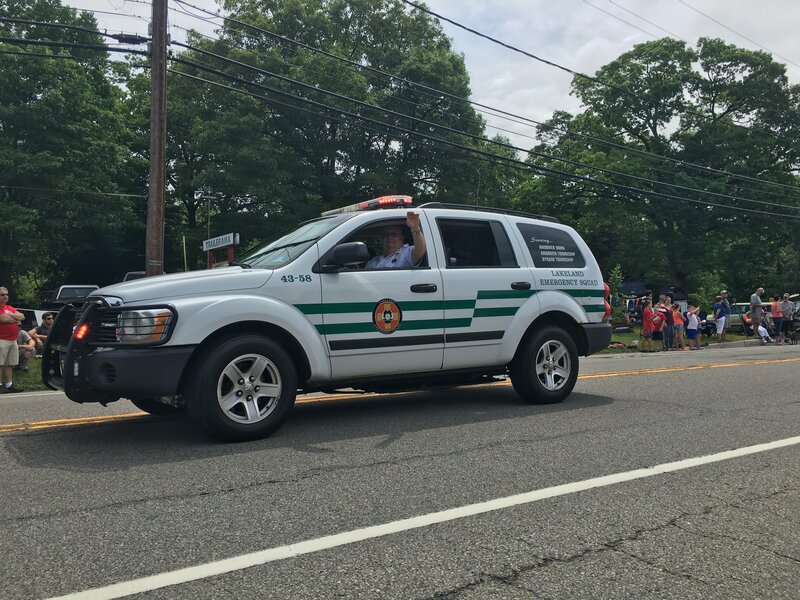 This ambulance was licensed by the State DOH in February 2017. Heavy Rescue 4356 is a 2006 Chevrolet C5500 4×4 Crew Cab with a 12’ Anchor-Richey EVS rescue body. 4356 runs out of LES Headquarters and responds to motor vehicle accidents, fire calls, any rehab assignment, or other type of rescue call. In addition to standard rescue equipment, the truck is equipped with a light tower and rehab supplies, carrying two 10′ x 10′ tents, two misting fans, a portable heater, ample amounts of drinking water, and non-perishable food. This unit also responds with our BLS crews to any call on the Interstate to act as a traffic buffer, helping to ensure safe operations for our members and patients. FRU 4358 is a 2006 Dodge Durango First Response & Incident Command Unit. Formerly a resident of our Andover Township building until February 2017 when our night crews were consolidated into one shift and we began planning for the delivery of the new SSU 4359, 4358 is now housed at Station 1 when not on the road. 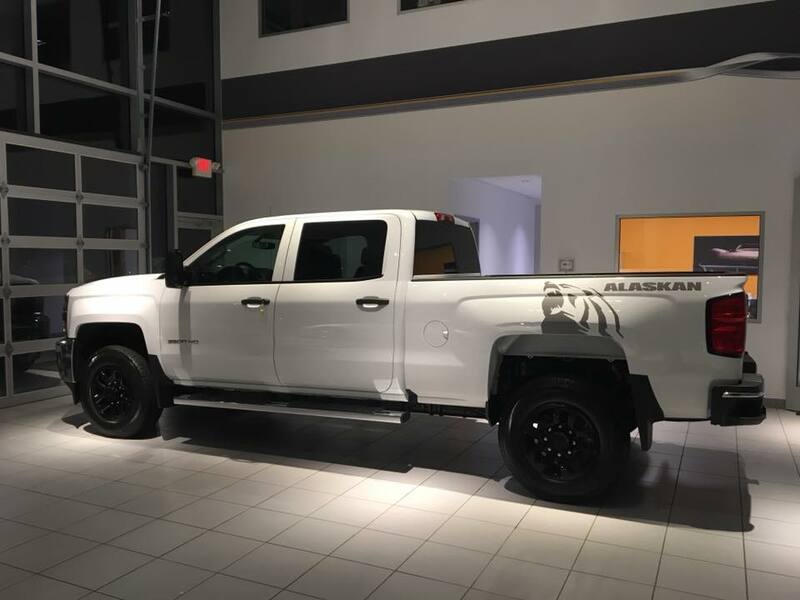 SSU 4359 is a 2018 Chevrolet Silverado 3500 Alaskan Edition 4×4 pick-up. 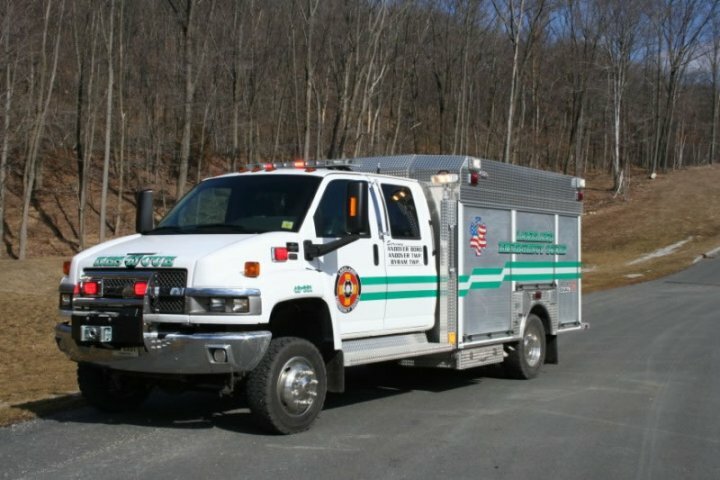 The Special Services Unit is a multi-faceted vehicle equipped as a first response unit, light rescue, rehab, incident command, and tow vehicle for the SAM Trailer. This unit has not yet been placed in service as it is undergoing to the upfit process after the Squad took delivery on December 5, 2017. This unit is assigned to Station 2. 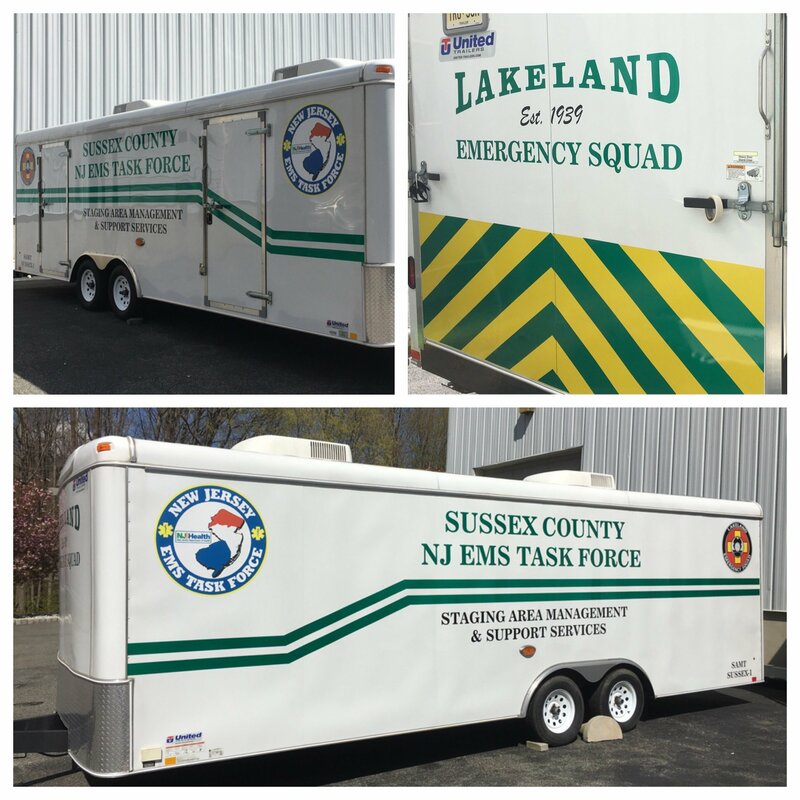 Sussex SAMT-1 is a 24′ enclosed trailer operated by Lakeland EMS in cooperation with the NJ EMS Task Force. 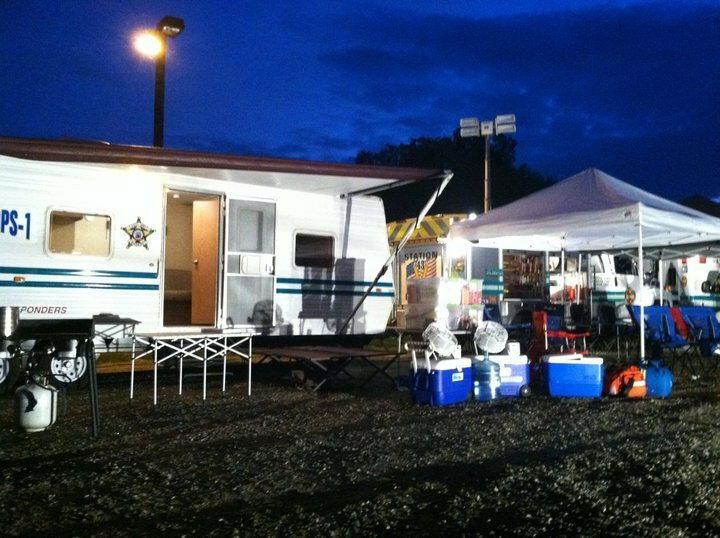 This asset is the assigned Staging Area Management Trailer for Sussex County, but also setup for larger-scale rehab operations or extended event operations as an ICP. Beginning in February 2017, our 2003 twin Horton 523 ambulances underwent a remount and refurb process to their current state. In the interim, 4351 (top below) and 4353 (bottom below) were assigned loaner ambulances from VCI Emergency Vehicles. 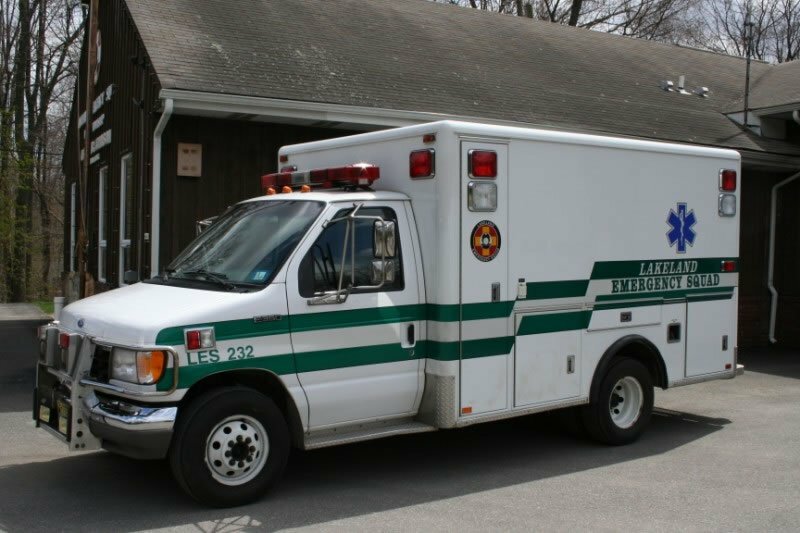 These twin 2006 Wheeled Coach loaners were the previous fleet from Philipstown Volunteer Ambulance Corp. from Putnam County, NY. 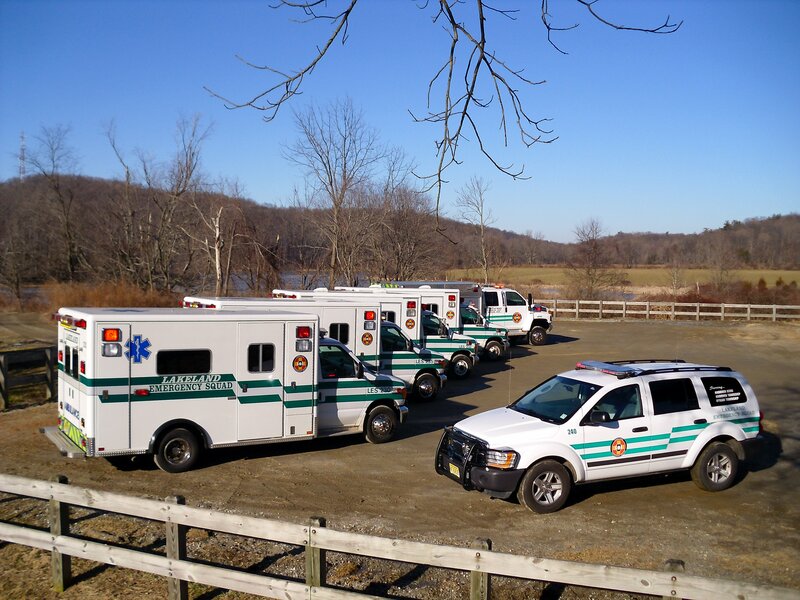 On October 6, 2017, we took delivery of the second remount and bid farewell to the Philipstown trucks, returning our fleet back to exclusively white and green vehicles. BLS 4351 (formerly 43-230) was a 2003 Horton 523 on a Ford E450 Super Duty chassis. 4351 (as 43-230) was the work-horse of the fleet up until the 2009 ambulances arrived, when she was the sole first due ambulance out of Station 2 alongside 43-233. 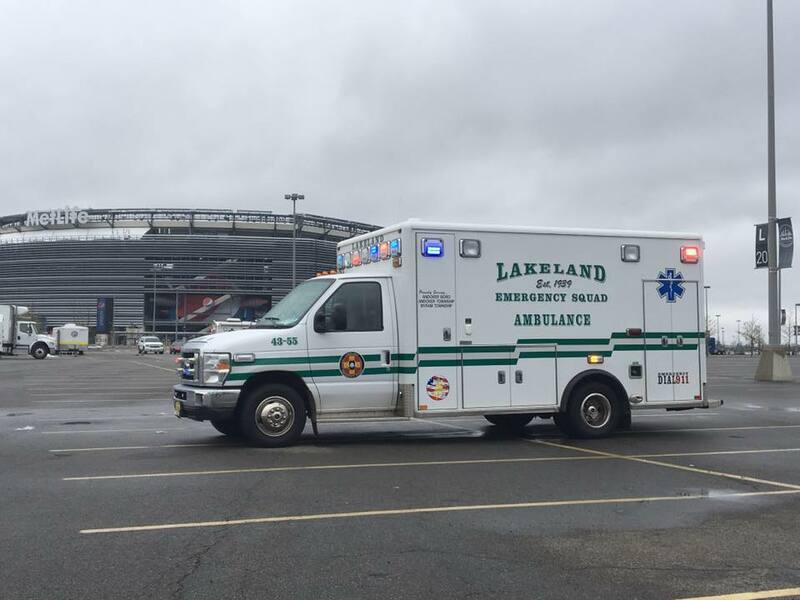 From the delivery of the 2009 ambulances until her retirement in 2017, she shared a duty rotation with BLS 4355. 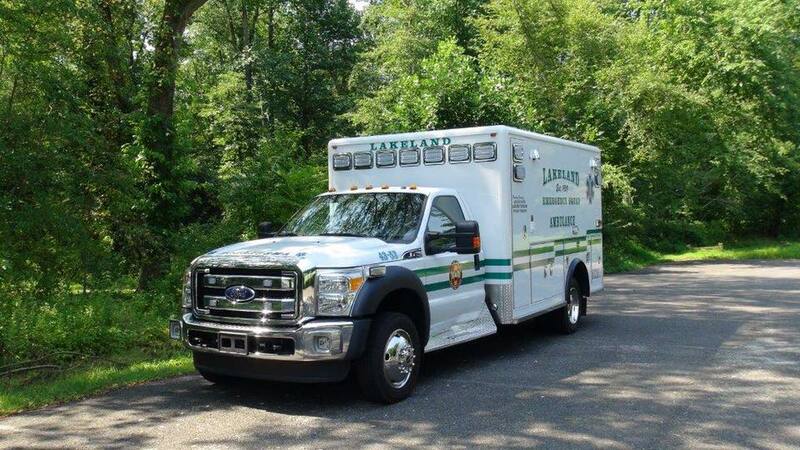 This ambulance was taken out of service on February 22, 2017 for remounting and returned to service on a Ford F-Series 4×4 chassis on October 12, 2017 following NJ DOH inspection. BLS 4353 (formerly 43-235) was a 2003 Horton 523 on a Ford E450 Super Duty chassis. 4353 was assigned to Station 1 in Byram for most of her life with us, where she shared the the first-out rotation with 4352 since 2009. Prior to that, she was a first-out ambulance as 43-235 when the predecessor to her twin 43-230 was second due from HQ. BLS 4353 is the twin of 4351. 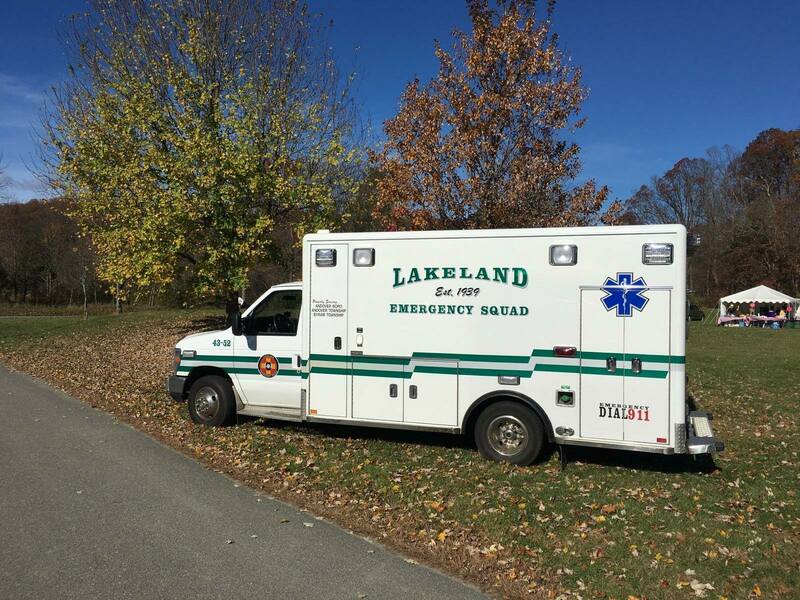 This ambulance was taken out of service for remount on February 1, 2017 and returned to service following State DOH inspection on September 8, 2017 on a Ford F-Series 4×4 chassis, taking her inaugural call as a flyout that afternoon. In 2014, our fleet was re-numbered to better align with a standardized system within and around Sussex County (43-230 became BLS 4351, 43-232 became BLS 4352, 43-235 became BLS 4353, 43-234 became BLS 4355, 43-231 became Rescue 4356, and 43-240 became FRU 4358; 43-233 had previously been retired so it did not receive a new number, but would otherwise take the BLS 4354 spot). This fleet picture was taken in the late Fall of 2009 and is the last photo these trucks all had together. In the following months, Ambulances 43-232 and 43-234 were replaced after 17 and 18 years of service, respectively. Below is a picture of the fleet in 2006, prior to the arrival of the new rescue, new first response unit, and the 2009 ambulances. This is one of the last pictures these trucks all had together. Left to Right: 230, 234, 240, 231, 233, 235. Missing from photo: 232 (out of service for maintenance at the time this picture was taken). FRU 43-240 (shown in the middle above) was a 1994? 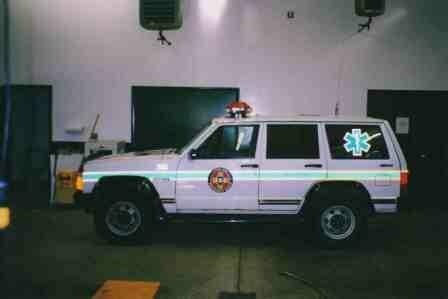 Jeep Cherokee 4×4. This unit served as a first response and command unit prior to retirement in 2006 when the Durango arrived. The old 240 was part of the command post for the Able Energy disaster in Newton on March 14, 2003. BLS 43-234 was a 1992 Horton on a Ford E350 chassis and was assigned to Goodale for most of the time it was in service. It first served as the primary rig when 233 was second due prior to the arrival of the 2003 trucks, and was then the secondary rig beside 230. She was retired from service on March 10, 2010, having served the Squad faithfully for almost 18 years and over 104,000 miles on the road. 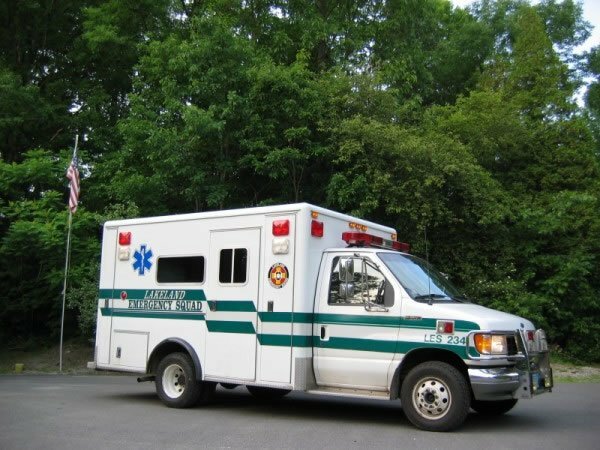 BLS 43-232 was a 1993 Horton on a Ford E350 chassis. 232 served as the Byram first due ambulance for ten years when the old 230 was secondary at Cranberry. When the 2003 rigs went into service, it was then moved to second due out of Cranberry. This 232 served the Squad for 17 years until retirement on February 15, 2010. 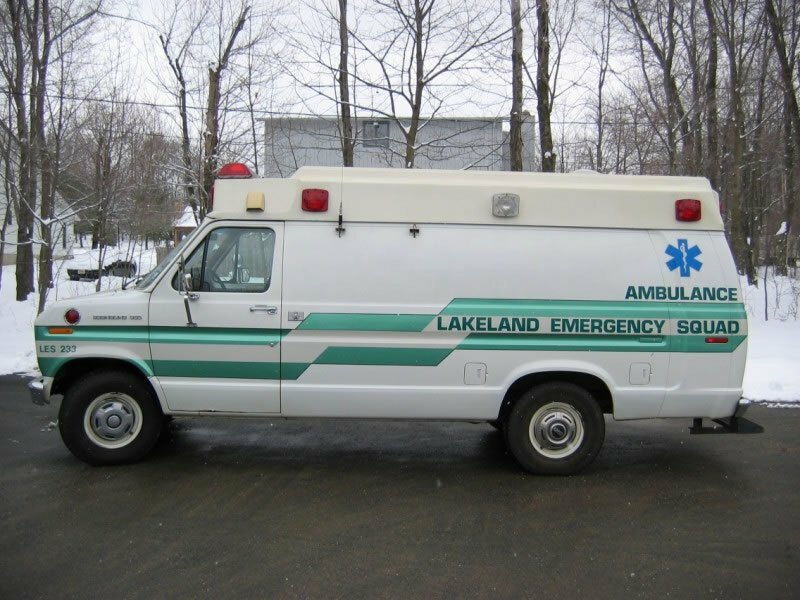 BLS 43-233 was a 1986 Ford Type II ambulance. 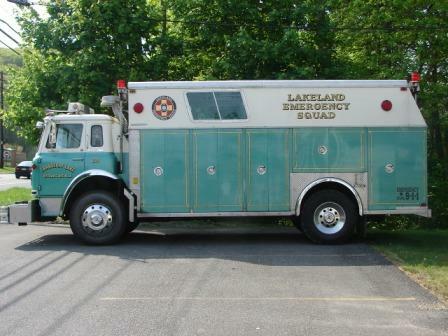 Early in its life it served the Squad as the transport rig; however, when routine transports trailed off, 233 served as a reliable second due truck out of Goodale for many years. With the arrival of the 2003 trucks, 233 was reassigned to replace the old 235 at the Lee Hill Building (St. 3) until it was later retired in 2008. Former Rescue 43-231 was a 1979 Saulsbury and was one of the first Heavy Rescues in Sussex County. 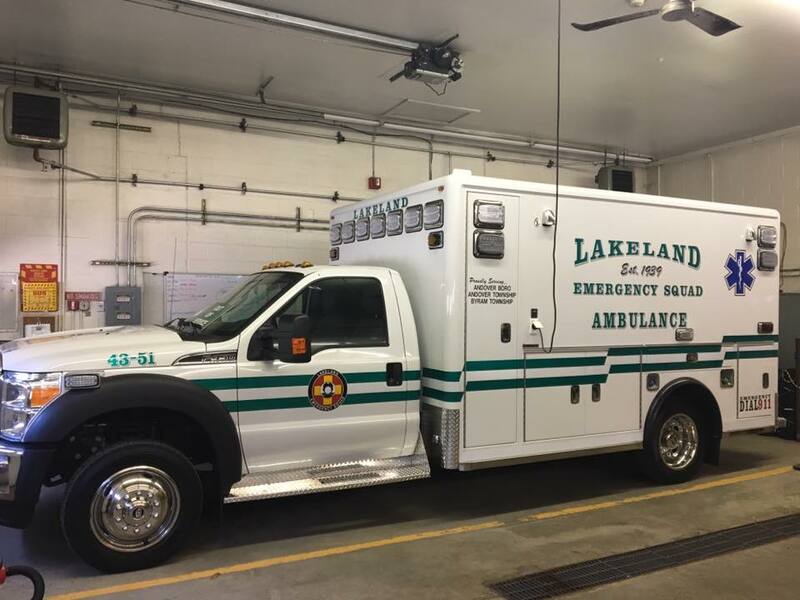 It served Lakeland and the surrounding area for nearly thirty years before it was retired from service in 2007 upon the arrival of the current 4356. Rehab Trailer 43-59 was a 30′ travel trailer operated from 2010 through 2016 as a cooperative project with Sussex County Sheriff’s Office of Emergency Management. The trailer was setup as a large-scale rehab unit, mass casualty, and extended-incident command base for incidents within Sussex County. It was retired in 2016 due to age and wear; the unit was built as a temporary housing shelter for Hurricane Katrina evacuees and served out its life much longer than originally intended.